Plus a Wedger worth $5 and our best apple recipes. This ingenious device makes the processing of apples incredibly quick and easy. It converts the apple into a peeled/cored spiral which, with the stroke of a knife, yields succulent apple slices. Ideal for fruit salad - and ready for cooking or drying. You can also peel without coring/slicing or core/slice without peeling. Peel/spiral other fruit - potatoes, eggplants? Yes, depending on their shape (including medium/small pears). The peeler is a quality product - cast frame, baked enamel finish and everything else either chrome or stainless. Factory settings for peel thickness and fruit shape can be varied. But most users find the factory settings perfect. The suction base works if your benchtop is suitable and, if not, the machine still does its job - peeling and coring apples in seconds. If you would like to see a demonstration go to Youtube and search apple peeler corers - there are dozens of clips which show how to use these appliances and what they do. One buyer said that her Mother, despite arthritis in her hands, could now peel apples. In fact everyone will find it easier to process apples with this ingenious machine. Another said:Thankyou for the prompt service. I love the apple peeler/slicer/corer. And, of course, these peelers make fantastic gifts. With gifts we are happy to include your message to the recipient. 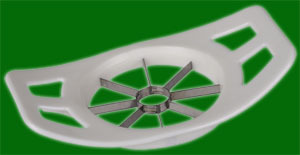 We also include a bonus apple corer/slicer (retail $5). This cores and slices apples in a flash - another great gadget - more for eating apples than cooking. And you also receive our best apple recipes. These include not only our own favourites but also many which have been supplied by customers and which we have tried successfully. Peelers are available in our apple shop for $15. Purchased on-line, or by letter, $24 including postage to anywhere in Australia (with wedger and recipes). If you want more than one peeler, email us indicating the number required and the delivery address and we'll get back to you with a price including postage. There is usually a saving in postage on more than one peeler (and you still get recipes and wedger with each peeler). Name: K and FD Kerrison. Label the deposit with your name and email us advising us of the deposit and giving us your postal addressAs soon as the payment appears in our account we send off the peeler and email confirmation. Peelers can be ordered by post and paid for by cheque or money order. Make these out to K. Kerrison, the name of our bank account, and post them to Kerrison's Orchard, 5 Beltana Rd., Pialligo, ACT, 2609. And include your postal address. Cheque orders are posted a week after receipt (cheque clearance). We have stocks of most parts for peelers. The cost for one part is generally $6 including postage but bulky parts cost more to post. And there are reductions for more than one part. email us your requirements (use the diagram to idenitify the part) and we will give you a quote. We sell peelers at special prices to schools and charities located in our region for fund-raising - fetes etc. - and buy back any unsold. Contact us for details. Send us an email (ken@kerrisonsorchard.com.au) if you need more information, to arrange a pick-up time or if you have any problems/queries. We support this product. 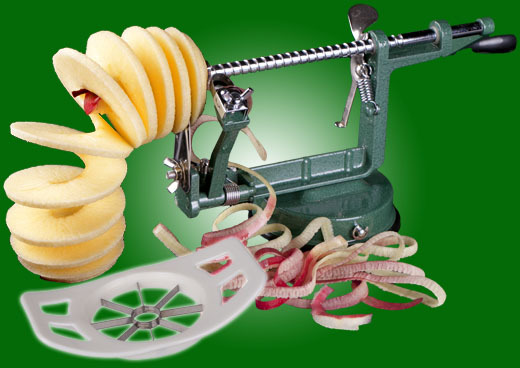 If you have any problems with an apple peeler, even it you did not buy it from us, let us know and we can usually help.